Note: These credentials are entered into an Oracle Eloqua login page and are not provided directly to Brightcove. Lead forms - Create Eloqua forms that will appear automatically as viewers watch videos. For information, see Creating Custom Lead Forms for Oracle Eloqua. Data transfer - Viewing data that is more than 15 minutes old is sent from Video Cloud to Oracle Eloqua four times per hour. Note that this means that viewing data can take up to 30 minutes to appear in Oracle Eloqua. Data retention - Data collected can optionally be retained in Video Cloud for up to 6 months. Before configuring the integration with Eloqua, we recommend that you open a new browser window and manually log out of your Eloqua account. This will ensure that when you configure the integration, you will be prompted to login to your Eloqua account and you can confirm that you are using the correct account. 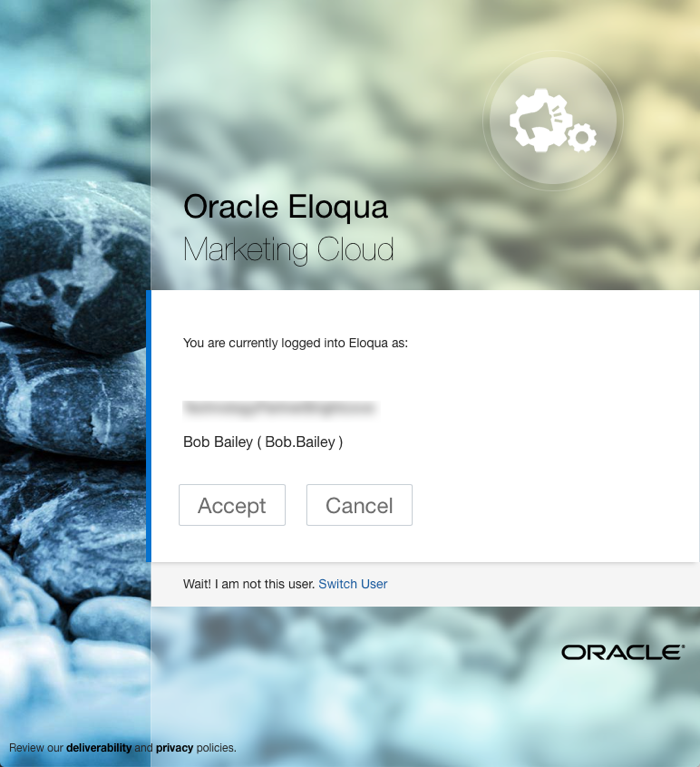 Follow these steps to setup the connection between Video Cloud and Oracle Eloqua. Select Eloqua as the integration. Note: The data connections that are available are based upon your Video Cloud subscription. You will be prompted to sign in to Eloqua. 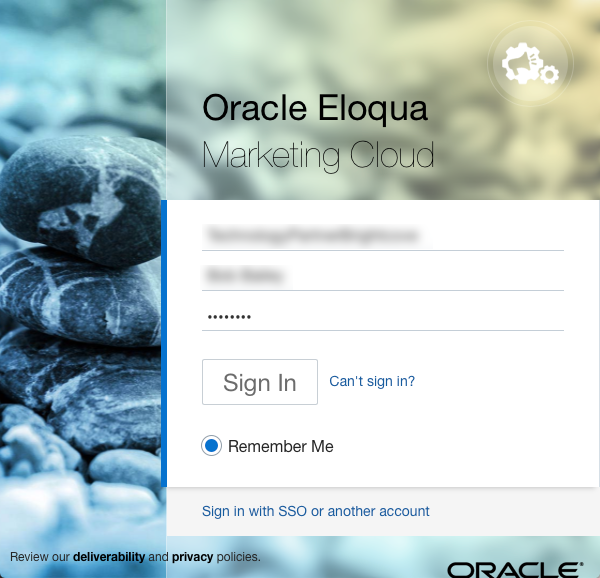 Enter your Eloqua Company Name, Username and Password. Click Sign In. 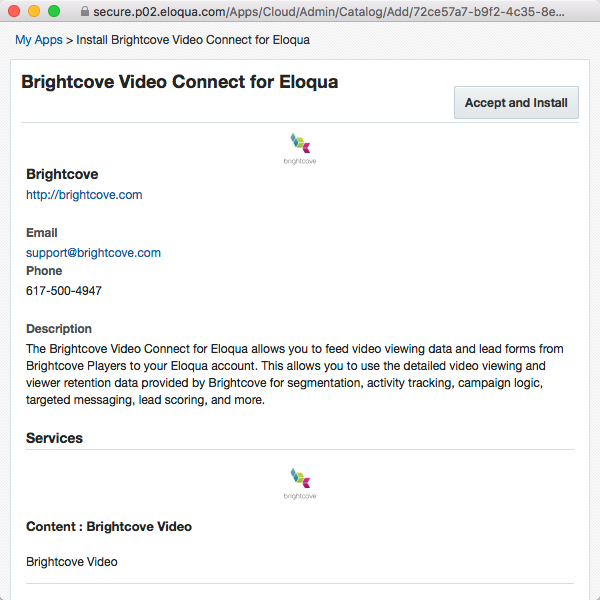 If the login is successful, you will prompted to install the Brightcove Video Connect for Eloqua app. Click Accept and Install. You will be prompted to enable Eloqua for the account. Click Enable. 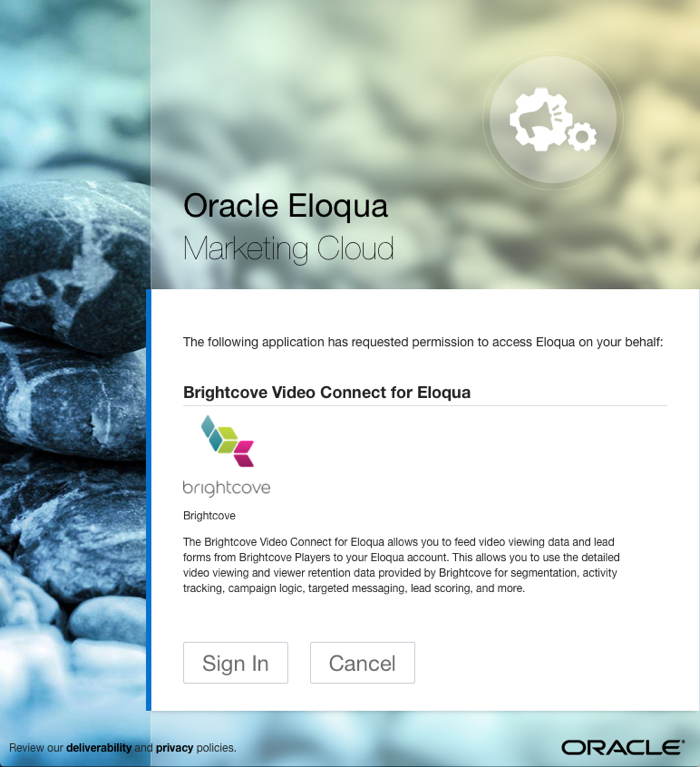 You will be prompted to allow Brightcove Video Connect for Eloqua to access your Eloqua account. Click Sign In. Confirm your company name and username and click Accept. You will be prompted to setup Eloqua. Click Setup Eloqua. 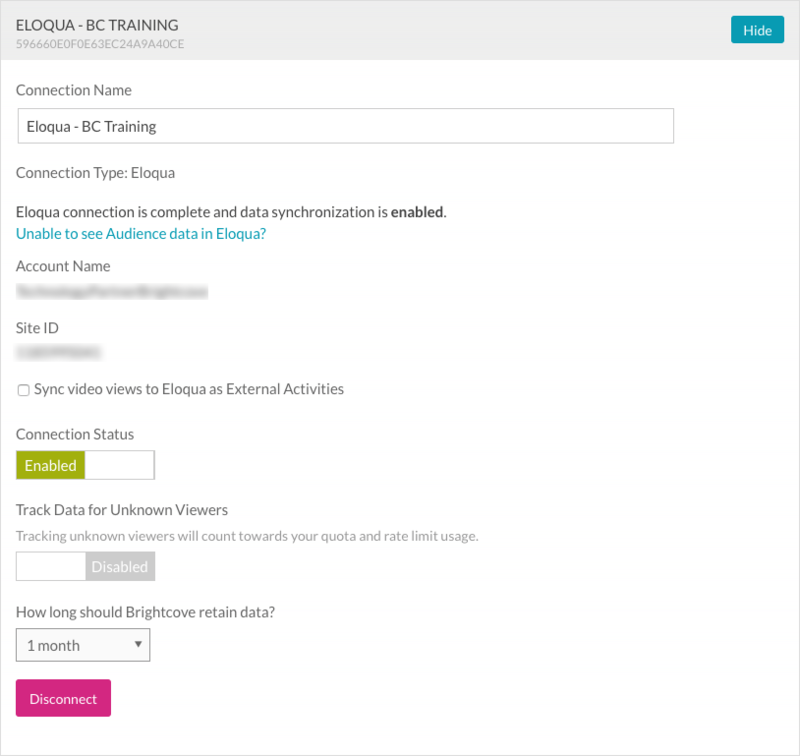 Once the Video Cloud to Oracle Eloqua connection has been made, you can configure the integration. Check Sync video views to Eloqua as External Activities to sync views as external activities. External activities are another place to put information in Eloqua. Publishers may choose to do reporting or trigger things in Eloqua using external activities. For more information, see the Eloqua documentation. By default, the Connection Status will be Enabled. The Connection Status determines if Video Cloud video engagement data is sent to Oracle Eloqua. By default, Track Data for Unknown Viewers will be Disabled. This setting determines if video engagement data is saved in Video Cloud when the viewer is unknown. Only data for known viewers is sent to Eloqua. To remove the integration with Oracle Eloqua, click Disconnect. The bottom of the page will list all Audience-enabled players and associated lead forms. The Audience module supports multiple connections to marketing platforms. Click Add New Connection to configure additional integrations. When the integration is configured, test the integration to confirm that video view data is being sent to Eloqua. For information on verifying the integration, see the Eloqua Integration Testing Guide. Video engagement data will only be sent to Eloqua when you are using an Audience-enabled video player. For information on creating an Audience-enabled Brightcove Player, see Creating an Audience-enabled Player. Audience will then pass that value along to Eloqua as another field that is synced.